Although the crypto industry has its fair share of over-ardent speculators, many of which are blinded by visions of grandeur, high ceilings, and chandeliers, others in this nascent line of business have erred on the side of caution. One such skeptical optimist, known for his intriguing, yet controversial statements, has even claimed that Bitcoin won’t see a breakout until 2019 at the earliest. This soothsayer in question is Vinny Lingham, who CNBC recently dubbed the “Oracle of Bitcoin” during a recent installment of Fast Money. Lingham, CEO of blockchain-centric identity ecosystem Civic, cut out some time to speak to Fast Money’s panel on Monday, discussing how he expects for the crypto market to progress. Asking the million dollar question, CNBC anchor Mellisa Lee queried Lingham, also an investor on South Africa’s Shark Tank, about where BTC could be headed next. Taking the question in stride, ballyhooing his normal sentiment, the Civic executive noted that Bitcoin will likely remain range-bound between $3,000 and $5,000 “for a while.” Giving his claim more specificity, Lingham explained that trading within the aforementioned $2,000-wide range is likely to continue for a minimum of three to six months, a common timeline in the eyes of Bitcoin’s short-term bears. Interestingly, the savant noted that as there are boatloads of buying pressure at $3,000, as it stands, that specific support level has a high possibility of holding its ground for months on end. Still, the entrepreneur added that if a convincing breakout isn’t established by the end of Bitcoin’s six-month range, a foray under $3,000 wouldn’t be out of the realm of possibility. So, the fact of the matter remains that for the time being, Lingham is hesitant to call for crypto’s next bull run, which could come at the drop of a dime. The South African entrepreneur, who has been accused of being in bed with crypto’s bears, even recently bet against Ronnie Moas, a diehard Bitcoin bull, at Las Vegas’ World Crypto Con. 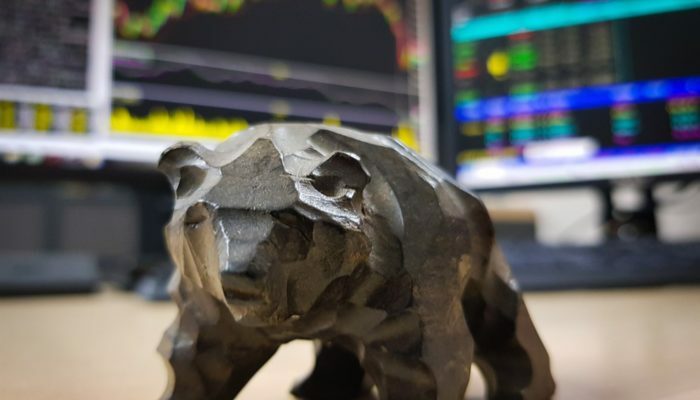 At the event, which saw its attendance dwindle as bears roamed free, Moas touted his thought process that BTC was poised to surpass $28,000 by 2019. Although Lingham wasn’t against Bitcoin’s long-term prospects, the Civic chief challenged Moas, prompting the Standpoint Research director to take a $20,000 bet regarding the ambitious forecast. Moas’ evidently subject to tunnel vision, accepted the bet, just before Lingham concluded this bout of banter by adding that “Crypto Winter” has yet to strike with nothing held back. Touching on his reasoning behind this short-term bearishness, a far cry from Tom Lee’s $15,000 prediction for Bitcoin, Lingham explained that in his eyes, by February 2017 it was clear that a cryptocurrency bubble was festering in this industry’s underlying folds. He then added that at the time, instead of fundamentals, the ideal price catalyst, speculation was driving Bitcoin’s move upwards. And interestingly, he claimed that the most recent bull run and the subsequent crash could have even jeopardized a key fundamental factor for Bitcoin, the approval of a crypto-backed, U.S.-based ETF, as regulators don’t have a penchant for parabolic price action. Lingham added that the same goes for institutional investors. Adding to the pile of bad news, Lingham added that Bitcoin’s narrative has been misconstrued over time, with BTC now being dubbed the digital store of value, rather than the decentralized payment network that it sought out to be. While this isn’t bearish in and of itself, the Civic CEO explained that other blockchain networks could overtake Bitcoin in terms of its value in day-to-day payments. But, aiming to end his segment on a high note, Lingham explained that if investors are risk-philic, now could be an optimal time to bet on a turnaround in the value of Bitcoin and its altcoin brethren.